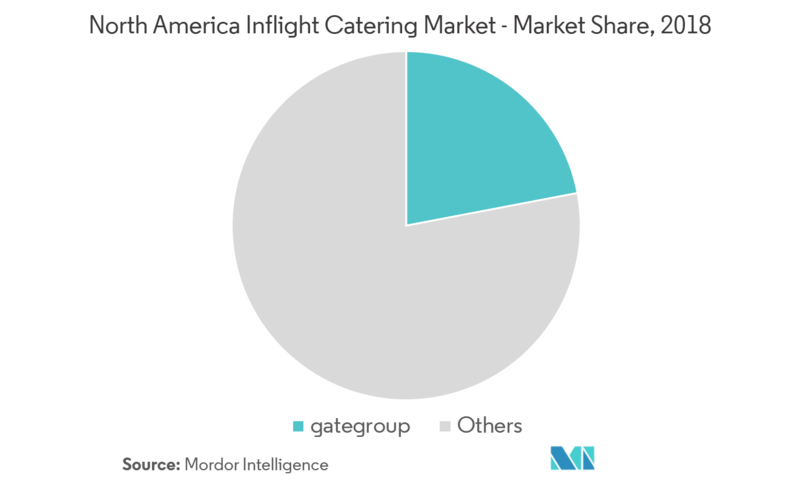 The North America Inflight Catering Market is segmented by Aircraft Seating Class (Economy, Business, First, Other Aircraft Seating Classes), Flight Service Type (Full-Service Carrier, Low-Cost Carrier, Other Flight Service Types), Food Type (Meals, Bakery and Confectionery, Beverages, Other Food Types), and Country. 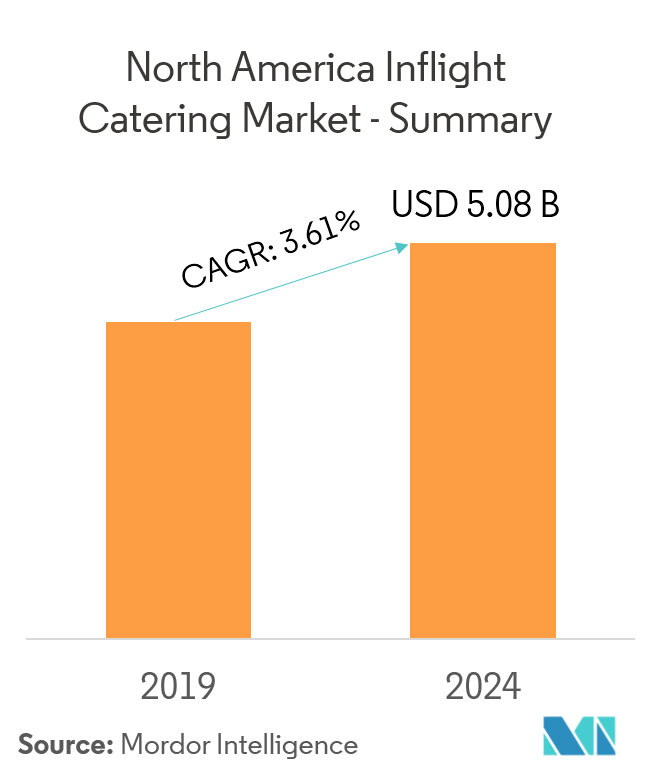 The North America inflight catering market is anticipated to grow and reach USD 5.08 billion by 2024, while recording a CAGR of 3.61% during the forecast period. Food quality has materialized as one of the vital key points of differentiation between the air carriers, owing to the growing fierce competition in the aviation sector. Therefore, airlines, worldwide, are investing huge amounts on in-flight catering. Economy class passengers are among the most vital contributors to the revenue generated by the airline. In order to keep their shares, most of the airlines are currently improving their service standards, as well as food quality. The quality of food provided to the passengers in the economy class has improved significantly and is expected to rise during the forecast period. Chips, sandwiches, dry fruits, cookies, grilled meat, seafood, and pasta are few of the popular dishes served on board. Better food quality has become the primary reason for the customers opting more expensive full-service carriers. Inflight catering is a business that provides food service specifically for airline companies. It involves providing meals for passengers on board, as well as for restaurants situated at the airport terminals. The economy class dominates the North America inflight catering market, followed by the business and first class. The economy class controls around 7/10th of the total share of the inflight catering services market. Since economy class passengers have a choice of the service and the type of airline, carriers cannot serve substandard meals and have to maintain high-quality standards. Most passengers of these regions view air travel as an experience and not just as a means to get from one point to another. Economy class, as a result, remains the most important segment for each airline. One of the major trends in economy class meals is the rising preference of passengers, especially from the matured markets, for healthy inflight food services. Historically, business and first class passengers were always ahead in demanding healthy food options, but now the economy class passengers are also adding to the demand. Instead of red meat options, like beef and pork, passengers are demanding white meat, such as chicken and fish. The economy class segment is expected to be the fastest-growing segment of the inflight catering market, as more airlines are planning to upgrade the meal offerings in this segment and meet the rising demands of the passengers. The North America diet varies considerably with each state. Eating habits of the two major North America countries, the United States and Canada, differ considerably from each other. In Canada, food intake in the Quebec region differs from the rest of the provinces. Smaller countries in the continent vary even more. So carriers have to arrange and stock up food accordingly, sufficing to their routes and the region they are operating in. The trend is, however, more toward eating healthy food, which is observed throughout the continent, particularly in the United States. More than 1/4th of the US citizens, still consume fast food every day, but the percentage is dropping gradually. The high obesity rate is a critical concern behind the changing food pattern. Healthy food has achieved significant traction. Food, like yogurt, poultry, sandwiches, and fresh fruits, has witnessed a spike in demand, in the field of inflight catering. In addition, the country is also a large market for chocolates, bakeries, and other confectionaries. The demand for low-calorie meals has resulted in a significant change in the food offerings during flights. 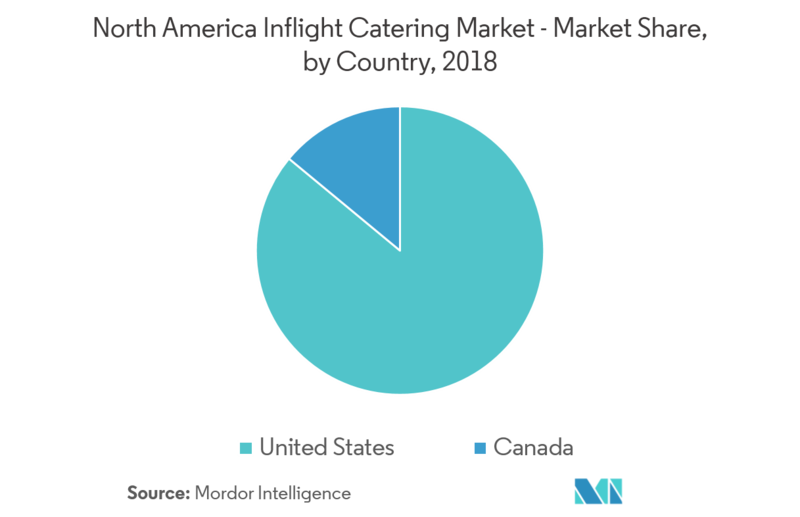 The North America inflight catering market is undergoing a slow but steady consolidation, with major players procuring other significant regional players. Gate Gourmet, which started as a small inflight caterer has, over the years, procured most of its competitors, and it now stands at the top of the global inflight catering market share, by revenue. Its geographical presence has also expanded significantly during the past decade, solidifying its presence and customers across international regions. Market consolidation has allowed smaller regional players to target just one competitor to survive in the market, while it also allowed new entrants to enter the market, with lesser resistance due to cheaper services. LSG Sky Chef, gategroup, Journey Group PLC, and Flying Food Group are some of the prominent players in the North America inflight catering market.